I generally have a hard-fast rule against what I refer to as domestic sewing. Despite the fact that I rarely go 24 hours without sewing something I don't do practical things like replacing buttons or hemming pants. At the risk of sounding pretensious, I'm an artist, I have to follow my vision. So it's OK for me to create quilts for the beach house I don't have, not so much the house I live in. In general, the less practical the product the more compelling the project. Recently I had a change of heart. Since we moved in to this house 5 years ago my husband has been begging me to hang a curtain in the bathroom. Nothing fancy, just something to hide the ugly blinds. Let's just say I was less the motivated. Sure it was ugly but I don't use that bathroom. 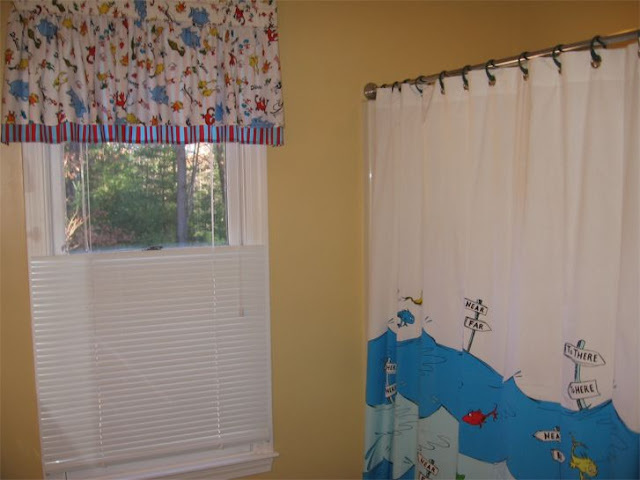 And I tried a couple of times but I could never quite find the "right" fabric to go with the fishies on the shower curtain. But sometimes things just come together and suddenly I was inspired... it started when I first saw the Robert Kauffman was coming out with Dr. Seuss fabric. We LOVE Dr. Seuss, it's my kids' favorite and I can recite The Lorax from memory when necessary. But I was still dreaming of the quilts I could make... until I saw Pottery Barn had come out with the shower curtain. Suddenly I had a plan. Of course like all my plans there were stumbling blocks. First I had to wait, like forever, for the fabric to actually be released. Then I thought I was going to use this but after ordering 2 yards of it and draping it on my window frame I decided the scale was off and I didn't like it for a valance after all. Fortunately I had also ordered fat quarter packs of both Celebrate Seuss and The Cat in the Hat so I could sample to my heart's content. Once I finally made the decision and tracked down the appropriate fabrics the construction was a breeze. Here's the final result... the new valance and shower curtain.